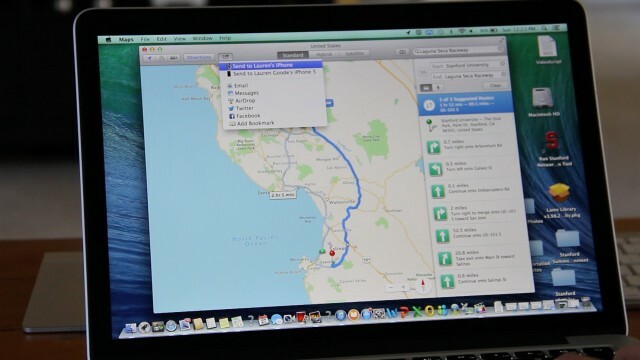 Apple Maps on a Mavericks desktop lets you send directions directly from the desktop to an iPhone, provided it's running iOS 7. Mavericks now lets you fully expand apps on a secondary screen, while still running Finder, a browser or other apps on the main screen. A sidebar on the left-hand side of the Safari browser now shows links from the people you follow on Twitter and LinkedIn. Big cats are out. Big waves are in. 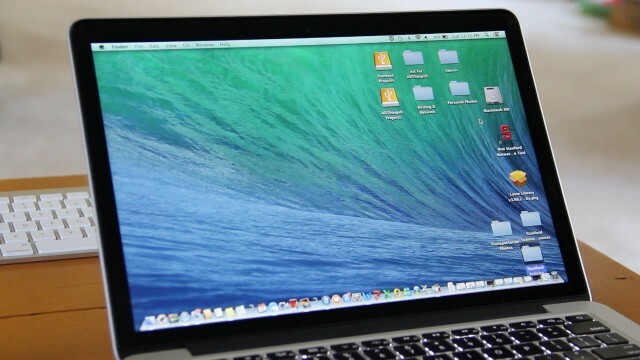 I’m referring, of course, to Mavericks OS X, the new operating system for Mac computers. It’s Apple’s 10th OS X operating system and it’s the first one in many years without a large-feline moniker, named instead after famously formidable surfing waves off the coast of California. Since the OS is a free upgrade, this column is not about whether the upgrade is “worth it.” Instead, I’ve focused on a handful of key features that consumers can expect with Mavericks. Some of them are useful. Others feel obvious, because, in some cases, Apple is playing catch-up. 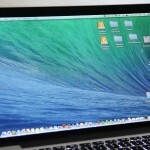 To start, Apple said that Mavericks will only run on machines from 2009 and later, though it might work on some computers from as far back as 2007. You’ll also need at least two gigabytes of RAM, and two hours of your time to complete the Mavericks install process. In my experience, the installation on my 2012, 13-inch MacBook Pro took closer to two and a half hours. Okay, you’ve installed Mavericks. Now what? Well, Apple claims you can expect better battery life while Web browsing or watching an iTunes movie. At a launch event last week, the company used words like “timer coalescing” and “compressed memory,” which is enough to make any non-techie’s head hurt. Basically, this means that the new software groups tasks together so the processor can remain in an idle, low-power state more often. I ran three battery tests using AllThingsD’s usual method, which includes setting the display to 100 percent brightness, playing iTunes music on a loop, leaving Wi-Fi on, running a Mail client, and never allowing the computer to sleep. 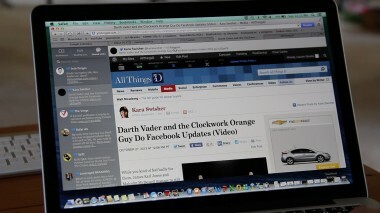 My 2012 MacBook Pro running Mountain Lion lasted five hours and 13 minutes. Then I installed Mavericks, and started again. This time it lasted five hours and 20 minutes – not much of a difference, but then again, I wasn’t really taxing the computer. 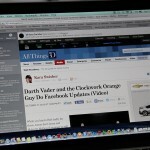 A brand-new MacBook Pro with Intel’s Haswell chip and the Mavericks OS, however, lasted for seven hours and 13 minutes. So it was the combination of new hardware and new software that gave the more impressive results. This is one of those features that seems small and obvious, and yet the organizational freak in me is still happy that Apple has added it. You can now create tabs within the Finder window, and share files by dragging them to the desired Finder tab, instead of cluttering your desktop with multiple juxtaposed Finder windows. You can also assign colors and tags, or keywords, to folders and files to make them inherently more searchable. Improvements to the Safari browser are also small but welcome. There is now a sidebar on the left-hand side of the browser that displays three tabs: Bookmarks (not new), Reading List (also not new, but improved), and Shared Links. If you link your Twitter account through System Preferences, tweets with links will appear under the Shared Links tab in Safari. It can also show links from the people you follow on LinkedIn. If you click on those links, the relevant tweet or story will immediately appear in the Safari browser. Scrolling down will show you the previously shared story in your Shared Links list, and the one before that, and so on. And you can retweet from Shared Links. I’d like this feature more if it were a real-time Twitter feed; as it is now, the Shared Links feed in Safari is designed to be refreshed manually, not automatically, so you have to hit Command+R to see new links. I do like the more noticeable Reading List, though, which works online or offline, and can be accessed from mobile, as well. The credit card info you normally type in can be saved in Safari, as well, and accessed on your iOS 7 iPad or iPhone. It’s the first time Apple is storing your credit card info at this level of the online buying process, and they say that it’s secure and can’t be viewed by Apple. Gilt is one of Apple’s early partners with this, so I logged in to Gilt, opted into notifications through Mavericks, and shopped. With my first purchase, I still had to fill out my personal billing and shipping information on the Web. But then I was asked through a drop-down in Safari if I wanted Safari to save my credit card information for use with other websites. With my next purchase, I shopped from my desktop, then later on picked up my iPhone, opened the Gilt app, and through a one-step checkout, completed the purchase on that device. Before, you could easily hook up and “mirror” a Mac computer to an external display. But everything on the device of origin — the dock, apps and open windows — would just appear on another screen. 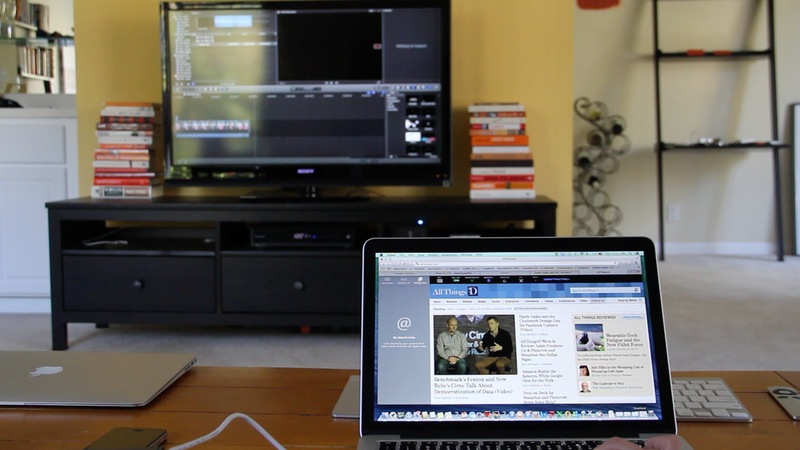 Now, Mavericks offers multiple viewing options from the same machine. 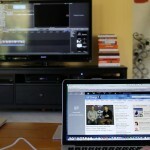 I was able to create extra desktop real estate — and not just mirror my computer desktop screen — on my TV, using Apple TV. On my laptop, I still had my dock, my email and a finder window. Then, on the TV, I was running PowerPoint or Final Cut Pro, and could view that application in full screen. This will also work on a standard secondary computer monitor. 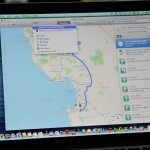 Apple Maps on a Mavericks desktop lets you send directions directly from the desktop to an iPhone, provided it’s running iOS 7. There are some other new items to consider with Mavericks. Apple is now offering new versions of its iWork and iLife apps for free, provided that you’ve purchased a brand-new device as of Sept. 1, or you were an existing owner of the apps. Apple is touting features like cloud collaboration through Pages in iWork, but this is pretty belated, since Microsoft and Google already offer cloud collaboration through their apps. Pages, Keynote and Numbers are also more intuitive and consumer-friendly, but some power users are complaining that legacy features are missing. 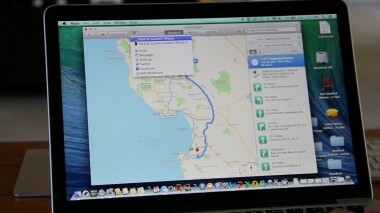 Mavericks also includes a desktop Maps app, which Apple has never done before. This allows you to search for directions on the desktop and, with the click of a share button, send them immediately to your iPhone (which has to be running iOS 7). This isn’t a new idea, however: Google has offered consumers the ability to send directions from its Chrome browser to Android phones for a while now. The OS isn’t without its early glitches. Some Mavericks users have said they’re experiencing problems with the desktop Mail client, and that their Gmail isn’t loading through the app. Others are encountering problems with “smart” mailboxes — like one that collects all unread messages across multiple accounts. Apple plans to issue a software update for this, the company said. Mavericks isn’t as monumental an upgrade as its name might suggest, but overall it brings some welcome additions. Assuming that Apple fixes the Mail problems, I see no reason not to ride the wave.